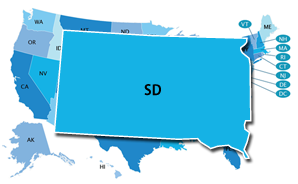 South Dakota has not adopted or made available a definition of college and career readiness. South Dakota state policy allows students to earn dual credit for academic or CTE postsecondary courses taken at their high school, a postsecondary institution, or virtually. Public postsecondary institutions in the state are not required to accept dual-enrollment credits (ECS, 2015). South Dakota is not participating in the Early College High School Initiative (ECHSI). More information about schools participating in ECHSI is available at the ECHSI website (Jobs for the Future, n.d.). South Dakota has adopted the National Career Clusters Framework and is implementing all 16 Career Clusters. In South Dakota, the Personal Learning Plan will serve as students’ guide to their pathway to graduation. Students' plans focus on high school course selection, taking into account the South Dakota Pathways to Graduation criteria and postsecondary requirements. Information on the Pathways to Graduation resources for that program must be incorporated into each student's plan. South Dakota's Individual Graduation Plan (IGP) is mandated by the state. It includes all students in Grades 8–12. South Dakota may have a state-specific Early Warning System, but the system is not publicly available.